In the last week, I’ve done something I never imagined myself doing: I’ve hosted two teachers from China while they studied our school system and took copious notes about our strengths and weaknesses. Did I mention that I let two strangers with a limited understanding of English stay at my house? I showed them to their rooms, but they chose to stay together in one. Too much space, too much distance between rooms, and they felt more comfortable being in close proximity. They marveled at the number of bathrooms in our house, the amount of love we have for our dog, and the high activity level we maintain from day to day. During rides to school or over dinner, we stuttered through conversations, constantly searching for common words and understandings. My favorite verbal mishap was when I mentioned I had to stop at the doctor’s office for a shot. Their eyes widened with alarm until I found the right word, the one they knew, inoculation, which made them feel infinitely better. That’s when I realized how many idioms we Americans use and how confusing our vocabulary must be to the international visitor struggling to understand us. But this blog isn’t about language barriers. It’s about how Americans convey what kind of people we are without using any words at all. In the last week, I’ve been proud to be an American, and all the cynics and news programs in the world won’t sway me from that pride. My first foray beyond the house was taking Lucy and Apple to my church. I nearly cried when everyone in the vicinity – including “Mama,” who struggles with Altzheimers and always sits in front of us; the young girl with Downs Syndrome and the sweetest smile this side of Texas; black, white, and people of all backgrounds – extended their hands and warmly welcomed my guests to our church and to our country. They spoke slowly, considerately, putting our visitors at ease. Then Lucy looked up and noticed the orchestra. With an intake of breath, she listened intently to the violins’ mournful strains, and I’m sure it didn’t escape her notice that many of the orchestra members had faces like her own. I looked around my church – really looked, for maybe the first time – and noticed the colors, the mixed heritages, the age differences, the variety of dress and style. I remembered, gratefully, that I belong to a church that welcomes strangers and makes them feel at home because we ourselves were once strangers looking for a home. At sermon time, I found the proper chapter and verse and handed the Bible to Lucy. Intrigued when she pulled out her cell phone, I watched as she typed unfamiliar English words, found the Chinese translation, re-read the passage, and then nodded her head as understanding blossomed. She worked 10 times harder than anyone in that sanctuary that day, all to understand what the rest of us take for granted. We have the freedom to read whatever religious text we like, to make our own choices about what we believe and what god we worship. We can freely hand a Bible to someone who has journeyed thousands of miles to learn about us, with no fear of punishment or even judgment. Lucy and Apple cannot say the same. Later that week, I took my guests to visit some other schools so they could see the variety of educational options we enjoy in the U.S. Say what you will about the state of schools in America; I, for one, see some wonderful things going on, and I am proud that my Chinese guests got to witness them. In each school, the principal took time to introduce him or herself, to set up a personal tour, and even to offer a Chinese interpreter. My guests walked from classroom to classroom where they heard their own language being spoken, where they saw their own flag hanging with 50 others, all representing the cultures within the school. And everyone they met extended kindness. I don’t teach at these schools, but I beamed with pride over the facilities, the diversity of the population, the choices offered to students, the engaged learning taking place, and the respect afforded these strangers from a faraway place. At my own school, students and teachers welcomed our visitors into their homes, carted them around Houston, and invited them to teach Mandarin and speak to the Chinese Club. We made the trip possible, and because we did, Lucy and Apple came to an important realization: No one had to bend over backward for them, but they did, because that’s what Americans do. When I asked my new friends for their thoughts on Americans, they didn’t hesitate. They said we are the most warm-hearted people they’ve ever met. They said we work harder than they ever imagined, that we are nothing like the stereotype of Americans they see in films. They loved that we offer our kids choices, give them voices, and respect them enough to value their opinions. They were flabbergasted by our loyalty to our pets, our love of hugs and open affection, and our happiness. They found us to be courteous drivers (who knew?) , patient, and polite. In short, they were clearly surprised and impressed by us. Listening to our music, seeing our kids display impressive talent in the arts, and noting our entrepreneurial spirit, they suggested that maybe our freedom has brought about a high level of creativity and ingenuity that they lack in their own country. Lucy and Apple have only been with me a week, but I’ve lost track of the number of times I’ve teared up watching my fellow Americans interact with my Chinese visitors. Despite what our media and nightly news would have us believe, we really are a kind, open-hearted country that embraces people from all walks of life. I’ve seen it firsthand, and I’ve never been more proud to be an American. Kids cheat. What can parents do? Do your kids cheat on homework, quizzes, and tests? How would you know if they don’t get caught? As a teacher, I’m in the unfortunate position of seeing kids cheat, or try to cheat, on a regular basis. No one is above cheating, it seems. I have watched kids I deeply admire go down the cheating road, and I’d like to explain to parents the myriad reasons why they do it. 1. They didn’t do the homework, study, or prepare. Rather than take a zero, kids will resort to any last-minute tactic they can find. Desperation causes them to copy answers from others’ work, craft a cheat sheet, or steal a glance at a peer’s answers. Most will find reasons to justify their actions. 2. They got away with it before. Once they are successful at cheating, it’s all the easier the next time. And the more they do it, the more desensitized they become to the fact that it’s unethical. It doesn’t help when they hear others are cheating and getting good grades for their non-effort. Of course they’re going to question why they should do the hard work if they don’t have to. 3. They are overly anxious. High-achieving kids will do almost anything to get an A or maintain their grade point average. Rather than finding value in an assignment or test, they see each one as a means to an end, yet another hoop through wish to jump. They’re always afraid they won’t jump high enough, so they hedge their bet by cheating. 4. They are inherently impulsive. Teenagers are notorious for acting in the moment and believing with all their heart that they will escape the consequences. That lack of development of the frontal lobe gets them every time, and they truly don’t think ahead, especially when opportunities present themselves and they are forced to make quick decisions. With all those answers staring them in the face just a desk away, they are unlikely to look the other way. So what can you, as a parent, do to teach your kids not to cheat? 1. Encourage organized study habits. Teach your kids how to chunk assignments and study sessions over a period of days and avoid waiting until the last minute. Make sure they keep a calendar that includes daily review of notes or work on an assignment. 2. Let your kids know that cheating will not be tolerated. If you get wind of anything – your kids “borrowing” other kids’ homework, a cheat sheet left in a sweatshirt pocket, or a text that discusses test answers, deliver a swift and painful consequence. Send the message that you love them enough to teach them a hard lesson. 3. Stress learning over grades. Kids’ anxieties often stem from parental expectations and pressure. Let your kids know that as long as they’re doing their best, you’ll be proud of them. Reward their critical thinking and ingenuity, not their highest score on a test. 4. Consistently teach your kids that poor decisions lead to unwanted consequences. Since this idea isn’t biologically inherent to them yet, you have to teach it, over and over. Behaviors are learned and ethics are developed as we become aware not only of ourselves, but of others and how our actions affect them. Cheating is almost never a stand-alone offense; it arises from something else that is going on in kids’ lives. Discover what the cheating trigger is for your own kids, then set about dealing with the core of the problem. I don’t know about you, but I love a great book suggestion, especially when it comes to helping parents be better at the most important job they’ll ever tackle. 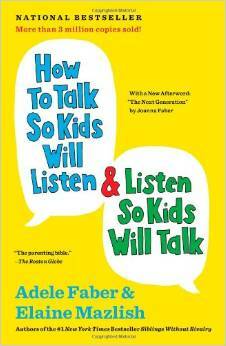 Below are my favorite parenting books, in no particular order. I would LOVE to hear yours! Academics, sports, clubs, work responsibilities – there are inexhaustible opportunities to involve – or over-involve yourself – in your kids’ lives. How do you find the right amount of involvement, that perfect balance between supporting your kids and smothering them? According to Bella English with the Boston Globe, parents who used to at least back off when their kids hit college now call advisers, professors, and even cafeteria ladies to advocate for their adult children. Check out the complete story at Snowplow Parents, where this new phrase is used to describe moms and dads who plow their way through college personnel to create a smooth path for their kids. It’s truly scary how little we prepare our kids for the real world and how long we hang on, hoping to spare them from having to take care of themselves. Cheer rather than criticize. Go to your kids’ sporting events and cheer from the stands. But don’t tell the coach how to coach, and don’t show up for the athletes’ pre-game dinner, unless you’ve volunteered to serve it. Let your kids have their space and let their coaches do their jobs. Facilitate rather than control. When your kids complain about an assignment, a teacher, or a grade, talk them through how to handle it and then send them back to school to remedy the situation. Do not involve yourself unless your child has already legitimately tried to get answers and has come back unsuccessful. Converse rather than accuse. When you do get involved, do it with a sense of camaraderie and support, versus an attack on someone who has wronged your child. Approach coaches and teachers with an open mind and a cooperative spirit, and you will get much, much further with everyone involved. BONUS: You’ll also model to your kids the most effective way to resolve issues and conflicts. Ask rather than guess. Ask your kids when they would like you to attend and when they would prefer you stay home. If you ask them with no personal agenda and a willingness to accept their answer, guilt-free, they will be honest with you. If you wouldn’t dream of missing one of their events, be there and enjoy it, but don’t expect your kids to hang out with you or even acknowledge you. Let them immerse themselves in their experiences without worrying about what you’re doing on the sidelines. Know your own child. Some would be heartbroken if you missed a single play; others would prefer you to stay away. Try not to take any of it personally, as this is more a reflection of them and where they are in their maturity, self-confidence, and peer group, than it is of you. Anyone who has more than one child knows that each kid is unique. Listen to your son or daughter and let them guide you in your level of involvement. You can’t protect your kids forever, nor should you try to. 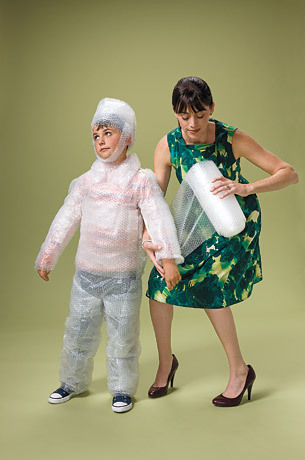 Put away the bubble wrap and step out of your kids’ way. Let them try, fail, get back up again, and learn from it all. It truly is the most loving thing you can do for your kids.